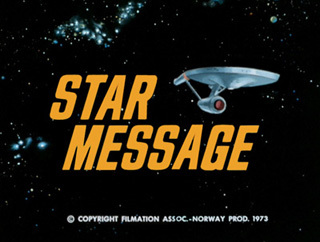 One question involving the animated STAR TREK series was whether they ever were broadcast along with a Public Service Announcement (PSA). Several animated Saturday morning series beginning in the 1970's had a 30-second "message" aimed at teaching the children viewers a lesson, like staying away from downed power lines and not being a bully. Several people have written in with fuzzy memories of Public Service Announcements featuring the animated STAR TREK cast. They wanted to know if they were ever produced and if they did exist why weren't they included on the recent DVD release. It turns out that there was at least one authentic Animated STAR TREK Public Service Announcement. It was created in 1975 or 1976 for the "Keep America Beautiful" campaign - 'Advertising Contributed for the Public Good.' A copy of this video in the form of a 16mm print surfaced recently and it is shown below. The television spot was created by Filmation Associates in their facility located on Sherman Way, just outside Hollywood and features the voices of STAR TREK actors William Shatner, Leonard Nimoy and George Takei. PSAs made their debut in conjunction with Filmation's Hardy Boys series in 1969. They didn't become a regular epilogue element until 1972 as part of Filmation's Fat Albert and the Cosby Kids series. Filmation was the first studio to add a moral in the form of an epilogue at the end of animated television episodes. In an interview for Agent DVD Online, Filmation co-founder Lou Scheimer said, "The PSAs were always about the moral in the show, literally to help the child with the concept of the lesson. The idea started with Bill Cosby doing the live-action segments on Fat Albert. It was very effective. We had these superhero shows and at the end the hero would talk about what was in the episode. It created really good will. Mothers were writing in. It was very successful for the kid audience." 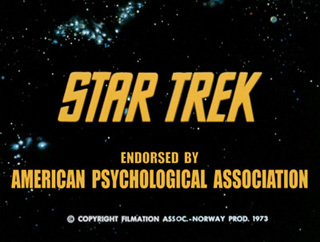 Apparently, no episode epilogue PSA's were ever made or televised for the animated STAR TREK series because the show did not feature physical violence which might have required a special moral to provide balance as the much-maligned superhero shows had. PSA epilogue for "And Let the Heavens Fall"
PSA epilogue for "Ptolemy Wept"